Col. Suzie Dietz, 99th Inpatient Operations Squadron commander, stands in front of a flight of Airmen during a change of command ceremony at Nellis Air Force Base, Nev., June 29, 2018. 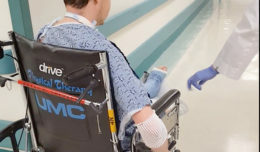 The 99th IPTS is responsible for delivering safe care for Department of Defense patients. The 99th Medical Group held a change of command ceremony June 29, at Nellis Air Force Base, Nev.
Col. Virginia Garner, 99th MDG outgoing commander, was responsible for a patient population of over 10,000 active duty members and more than 238,000 Department of Defense Veteran’s Affairs eligible beneficiaries. Chief Master Sgt. 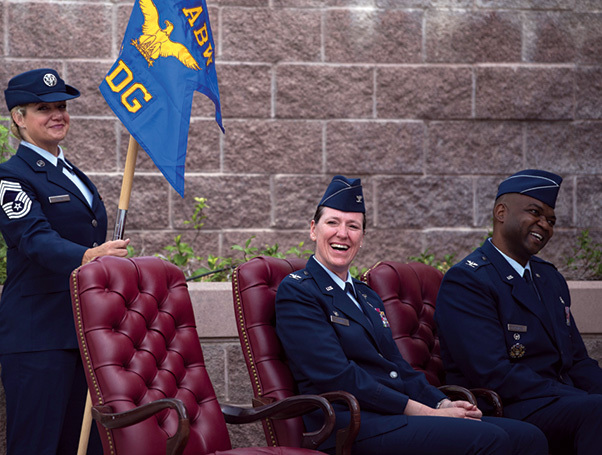 Nicole Owens, 99th Medical Group superintendent, Col. Virginia Garner, 99th MDG outgoing commander, and Col. Alfred Flowers Jr., 99th MDG incoming commander, laugh during a change of command ceremony at Nellis Air Force Base, Nev., June 29, 2018. Change of command ceremonies are a military tradition and date back to the time of Frederick the Great of Prussia. 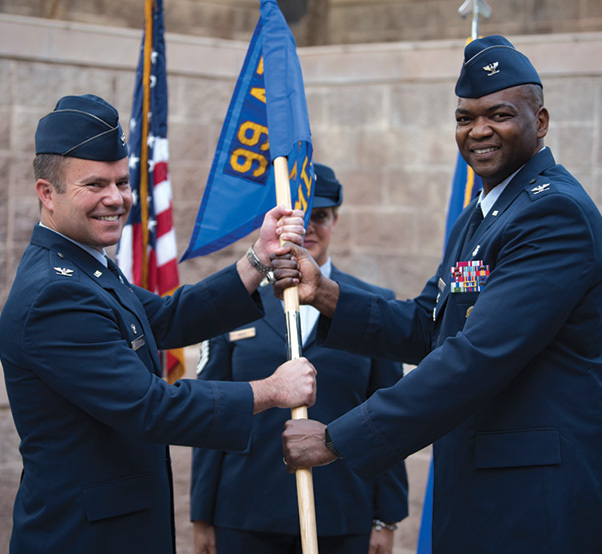 Col. Al Flowers Jr., 99th MDG incoming commander, said he was looking forward to working with the men and women that make up the 99th Air Base Wing. Change of command ceremonies are deeply rooted in military history. In modern day ceremonies, the flag is symbolic and is used to indicate authority over a unit. The outgoing commander surrenders the flag to the incoming commander, who at that moment assumes command. Col. Cavan Craddock, 99th Air Base Wing commander, awards a Legion of Merit to Col. Virginia Garner, 99th Medical Group commander during a change of command ceremony at Nellis Air Force Base, Nev., June 29, 2018. 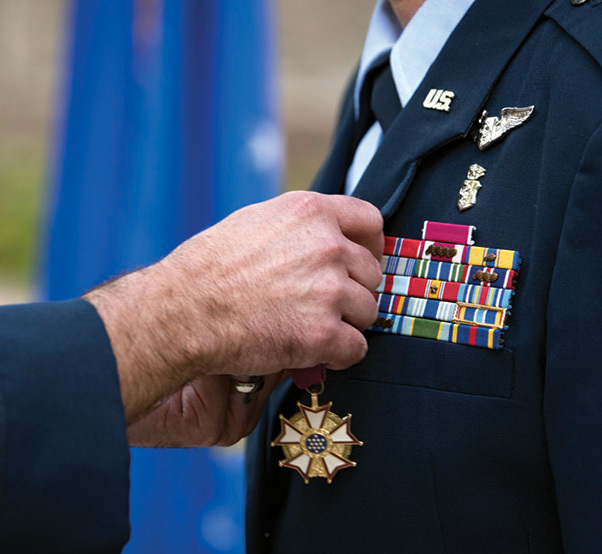 The Legion of Merit is awarded for exceptional service. Col. Alfred Flowers Jr., 99th Medical Group incoming commander, assumes command from Col. Cavan Craddock, 99th Air Base Wing commander, during a change of command ceremony at Nellis Air Force Base, Nev., June 29, 2018. Flowers’ last command was for the 52nd Medical Group at Spangdahlem Air Base, Germany. 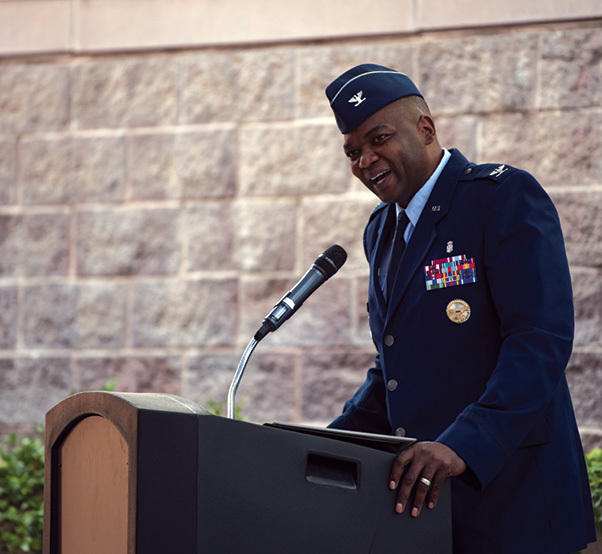 Col Alfred Flowers Jr., 99th Medical Group commander, speaks during a change of command ceremony at Nellis Air Force Base, Nev., June 29, 2018. One of Flowers’ priorities as commander is supporting the community and providing exceptional levels of health care.